Subaru of America, Inc. is helping the Academy bring its unique museum experience to schools and community centers throughout the greater Philadelphia, South Jersey, Delaware region. 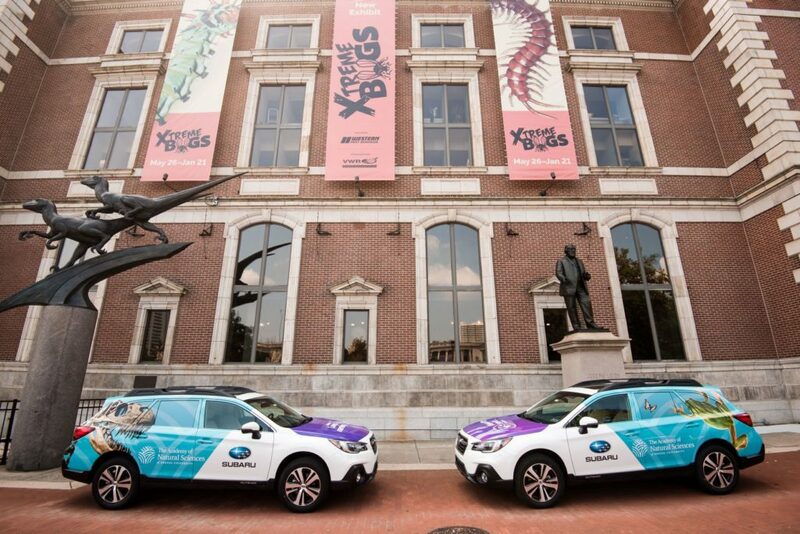 Subaru of America, headquartered in Camden, N.J., has generously donated two all-new 2019 Subaru Outback vehicles wrapped with colorful eye-popping graphics of some of the Academy’s animal ambassadors. The generous donation supports the Academy’s popular Academy on the Go program which brings live birds, reptiles and insects, plus enrichment activities and museum specimens, to thousands of students of all ages. Subaru generously donated these new vehicles for Academy-On-the-Go outreach program. 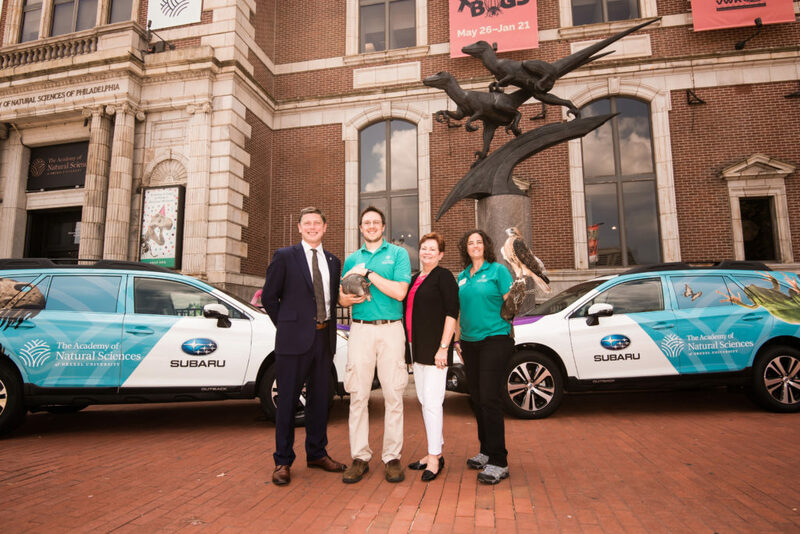 Pictured (from left) Academy President and CEO Scott Cooper, Outreach Programs Assistant Manager Mike Kaczmarcik, Subaru Manger, Corporate Responsibility and Philanthropy Sandy Capell, and Science Programs Coordinator Leigh Lightner with a raptor. And behind them is our signature velociraptor sculpture. In 2018, Academy educators visited more than 200 classrooms and communities, enlightening and inspiring more than 20,000 students. The automaker’s support also funds a dozen free class trips for students in its local community of Camden, N.J., to visit the Academy and enjoy the entire museum experience. Academy on the Go lessons are tied to state and national standards for science education. For information about how to bring Academy on the Go to your school or community event, visit ansp.org. If you’d like to support the program, visit our donation page or call the Institutional Advancement office at 215-299-1182. To learn more about the Subaru Love Promise and the automaker’s education and pets-focused initiatives, please visit https://www.subaru.com/love-promise.html.